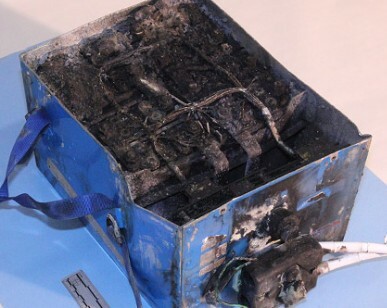 As mentioned previously (e.g., “Boeing’s Fix for its Flaming Lithium Batteries: Is There A Fatal Flaw?“), until Boeing digs down to the root cause of their lithium battery problems, they — and those who fly on the Dreamliner — will continue to be exposed to undefined risk. Posted on December 1, 2013, in Batteries, Electronic Components, Failure Analysis, Risk Assessment, Root Cause, Safety Analysis and tagged 787, Boeing dreamliner, flaming batteries, lithium batteries. Bookmark the permalink. Leave a comment.